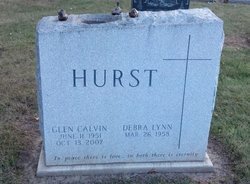 HURST, Glen Calvin died October 13, 2007 in Youngstown, Ohio. Born June 11, 1951 in Atlanta, GA, he spent most of his life in Vandalia as a mortgage broker after a brief period in Phoenix, AZ. 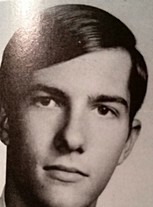 He graduated from Vandalia-Butler High School, Class of 1969 and was honorably discharged from the Marine Corp. after two years of service during the Vietnam conflict. As an active member of the Masonic Order, the Antioch Shriners, and of the St. Paul Lutheran Church, he deeply touched many members of our society. Glen is survived by his loving wife, Debra, and four sons, Chase, Aaron, Shawn and Matthew; his sister, Pamela Waltrip (James), and brother Gary; and many aunts and uncles. Funeral services will be held at 10:00 am, Monday, October 22 at St. Paul's Evangelical Lutheran Church, 7700 Dog Leg Rd., with Pastor John Johansen officiating. Burial will follow at Polk Grove Cemetery. The family will receive friends at the Morton & Whetstone Funeral Home, 139 S. Dixie Dr., on Sunday, October 21 from 2-4 pm. Memorial contributions in Glen's honor may be placed with the Vandalia Butler Food Pantry, P.O. Box 141, Vandalia, OH 45377. Click here to see Glen Calvin's last Profile entry.